"Saint Michael the Archangel, defend us in battle. Be our protection against the wickedness and snares of the devil... "
One of most popular angels in the Bible is Michael the Archangel. This particular angel is recognized in Christianity, Hebrew traditions, and even among the Islamics. He is most popular among Christians where he is viewed as one of the main commanders in the Army of God. There are several books contained within the Holy Bible that mention Michael the Archangel specifically by name. These books include that of Daniel, Jude, and Revelation. This angel is described as the one that will lead the armies that are on the side of God against Satan and his evil forces during the midst of his uprising. 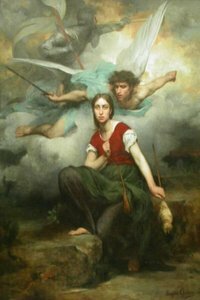 In addition to this, Michael the Archangel is considered to be the spiritual entity that stands up for the people of Israel. Out of all the angels in the Bible, Michael is the one that is considered to be the leader of the heavenly forces whose main goal is to lead the people of God in triumph over the ominous powers of Satan’s abode – hell. Since the era of time when Apostles were present in the church, this angel has received a tremendous amount of honor as a patron. In addition to this, he has been hailed as a protector of the church as a whole. While most commonly recognized as an Archangel, Michael has also been referred to as the leaders of all the angels – both in heaven and the ones that have fallen. He is also known by the name of “Prince of Seraphim”. In today’s world, the Archangel Michael is recognized as a special patron of certain groups such as grocers, those that are considered to be mariners, those that act as paratroopers, as well as police officers. He is also considered to be a patron of sickness. •	His ultimate role is to wage war and fight successfully against Satan and his forces. •	It is Michael’s responsibility to rescue all of the souls that have been faithful to God and believed in him from Stan and his forces at the hour that is often described as “death”. •	He is considered to be the ultimate champion for the people of God. •	His last, and perhaps his most important role as one of the Angels in the Bible is to call the souls of God’s followers away from the secular Earth and assist them in reaching the destination of their final judgment. As you can see, Michael the Archangel is one of the most important of all the angels in the Bible. He holds many important responsibilities and is revered by most as a leader, a rescuer, and even a Saint. According to the Holy Bible of the Christian religion, Saint Michael is very real. Just as any angelic being, the true stories of angels remain to be some of the world’s greatest unsolved mysteries.